One of the treatises commonly found in the collection known as al-Najibiyat al-Samarqandiyah is the formulary titled Kitāb al-Qarābādhīn ‘alá tartīb al-‘ilal. The title is also sometimes written asKitāb Aqrābādhīn ‘alá tartīb al-‘ilal. In this formulary, the recipes are arranged according to the location of the complaint, in order descending from head to foot and endings with theriacs and antidotes for the bites of mad dogs and insects. The treatise is not mentioned by the medieval bibliographers as being among the writings of Najīb al-Dīn al-Samarqandī, but there are numerous copies of the treatise preserved today under his name. For other copies, see A.Z. Iskandar, "A study of al-Samarqandi's medical writings", Le Museon, 85 (1972), p. 459 nt. 58; M. Ullmann [book review], Bibliotheca Orientalis, vol. 25 (1968), pp. 235-7; Dietrich, Medicinalia, pp. 209-210 no. 100; Los Angeles, UCLA Biomedical Library, Coll. 1062, MS 72 and MS 73 (Iskandar "UCLA", pp. 36-7); and Montreal, McGill University, Osler Library MS 7785/56 (Adam Gacek, Arabic Manuscripts in the Libraries of McGill University: Union Catalogue) (Montreal: McGill University Libraries, 1991), pp. 150-1 no. 162). For ten copies, see Ekmeleddin Ihsanoglu, editor, Fihris al-makhtutat al-tibb al-Islami bi-l-lughat al-‘arabiyah wa-al-turkiyah wa-al-farisiyah fi maktabat turkiya; Catalogue of Islamic Medical Manuscripts (in Arabic, Turkish, and Persian) in the Libraries of Turkey, prepared by Ramazan Sesen, Cemil Akpinar, and Cevad Izgi (Istanbul: Research Centre of Islamic History, Art and Culture, 1984), pp. 375-6. 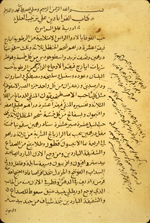 Opening an Arabic formulary titled Kitāb al-Qarābādhīn ‘alá tartīb al-‘ilal (Compound Remedies Arranged According to Ailment) by Najīb al-Dīn al-Samarqandī (d. 1222/619). The copy appears to have been made by the copyist preparing the subsequent item in the volume - one Muḥammad ibn Musá ibn Muḥammad, who worked in 1604/1012. There are marginalia in a later hand. Arabic. 88 leaves (fols. 89b-176b). Dimensions: 21 x 14.7 (text area 15.5 x 8) cm; 21 lines per page. The title occurs at the beginning of the text, fol. 89b, line 2. The author is not given. This treatise, which is preserved in many other copies, is generally attributed to Najīb al-Dīn al-Samarqandī. The handwriting appears to be identical to that of the following item, which is dated in the colophon on fol. 201a (lines 16-19): 14 Dhu al-Qad‘ah 1012 (=14 April 1604) and was made by the copyist Muḥammad ibn Musá ibn Muḥammad. This is an incomplete copy. The text breaks off in the middle of the discussion of theriac. The text is written in a small, careful, and consistent naskh script, in dense black ink with headings in red-brown. The text area has been frame-ruled. There are catchwords. There are extensive marginalia in several hands, mostly in Turkish. The volume consists of 202 leaves. Fol. 87b has two later notes giving recipes. Fols. 88ab and 89a are blank. Fol. 202b contains miscellaneous later therapeutic notes and recipes, in Arabic and Turkish. The entire volume is written on the same type of paper. Item 1 (fols. 1a-87a) is Najīb al-Dīn al-Samarqandī's Kitāb al-Aghdhiyah wa-al-ashribah (MS A 82, item 1); item 2 (fols. 89b-176b) is his Kitāb al-Qarābādhīn ‘alá tartīb al-‘ilal here catalogued; item 3 (fols. 177b-201a) his Kitāb al-Aghdhiyat al-marḍá (MS A 82, item 3); and item 4 (fols. 201b-202a) is the al-Risālah fī al-as’ilah al-ṭabī‘īyah al-Ḥārithīyah (MS A 82, item 4). The front cover is made of red leather over pasteboards. It has a blind-stamped central medallion, scalloped and with internal vegetal design. Blind quadrant lines and diagonals, decorated with S-stamps, radiate from the central design. The wide frame is formed of blind fillets on either side of blind-tooled S-stamps. The spine and back cover are recent red leather replacements. There are modern paper pastedowns and endpapers. There are owners's notes on fol. 1a (not dated). The volume was purchased in 1941 by the Army Medical Library from A. S. Yahuda who acquired it in Damietta, Egypt. 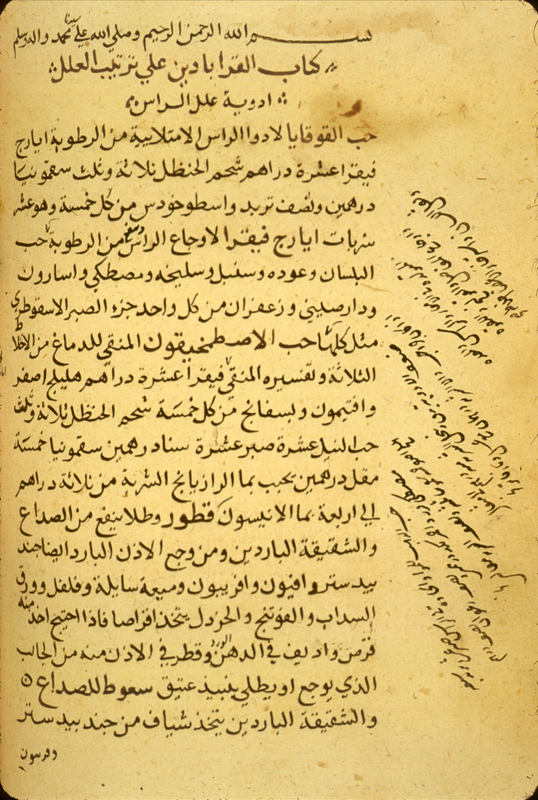 According to A.S. Yahuda's notes, he assigned to the manuscript the number ELS 1691 Med. 20 - a number also written in the volume. Schullian/Sommer, Cat. in incun. & MSS. p. 324, entry A82 no. 2. NLM Microfilm Reel: FILM 48-127 no. 6.